We’re dubbing 2017 the Year of Creativity and we want you to join in. What better way to do that than with some new STEAM apps and websites to explore? We’ve found 20 apps and 20 websites that you can use to integrate the arts everywhere. So whether you’re using Arts Integration, STEAM, PBL or any other maker-centered approach, these resources will make that process so much easier. Want to download these as a single PDF for reference later? We’ve broken these into two pages. One for apps and one for websites. We’ve also suggested which grade levels each app or website is most successful with. Just click, print and away you go! Amaziograph – How can you pack so much STEAM into one little app? Explore tessellations and symmetry by creating kaleidoscopes and mirrors using the graph and art brushes in the app. Easy to use interface, so it works for all grade levels. Heads Up! – This is a hugely popular game of digital flashcards and charades all rolled into one. What’s even better is that you can create your own category, so you can upload your own facts and lesson details that students can use to help invent and create their own solutions. Shadow Puppet – Easily create videos in the classroom with this free app by SeeSaw. Students as young as five can make videos to tell stories, explain ideas, or document their learning. 30+ lesson ideas supporting Common Core to make it easy to get started! Adobe Capture – We are loving all of the free tools that Adobe has been releasing recently and this one is at the top of our list. The app lets users take a photo of something and then trace the outline. A student can then erase parts, color it in, or enhance areas, all based on the initial sketch provided by the photo. Bloxels – Gaming is definitely “in” and this app makes it super easy for students to design their own. Students can use design-thinking to create their own characters, layouts and stories and then transform them into their own unique game. Remind – This app will help you keep parents (or even students) up-to-date on what’s happening in your classroom. You can use this to send quick, simple messages to any device for free! SoundPrism – This app lets your students build musical loops graphically. It’s a great tool for instantly integrating math, music and visual art and can be as complex or simple as you make it! Visual Poetry – Who doesn’t love when poetry meets art? This app makes it easy for you and your students to create both in a single spot. Assembly – They call this an app that makes “graphic design for everyone”. I have to say, it’s super easy to use and has so many applications that could connect arts and other content areas. I’m having a lot of fun playing with this app this week! MadPad – Make music out of anything! Turn everyday items and sounds into percussion instruments. It’s like Blue Man group in an app. DIY App – Creative Community for Kids – Do you ever have early finishers? If so, this app is a great way to keep them thinking and learning new skills. Specifically geared for students, it’s a safe online community where kids can learn almost any creative skill or project they are interested in. Color Vacuum – This unique, interactive and educational app by Curious Hat encourages children to explore, experience and experiment with the world of color in their immediate environment. Artisto – This is kind of like the Prisma app, but for videos. You can upload any video and change it into a work of art so that it’s an action-packed moving artwork. Lots of different ways to experiment with video production, story telling and art using this free app. Classroom Ideas to Go! 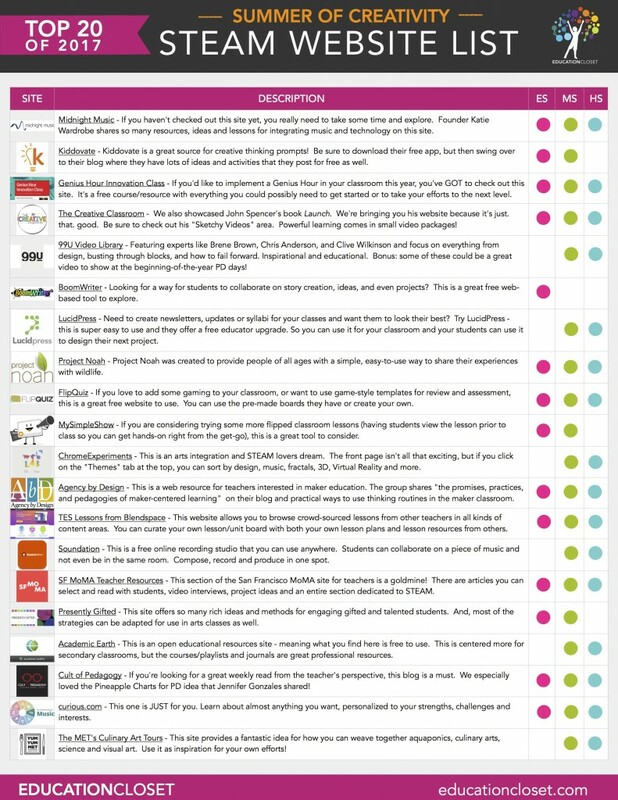 – There are over 1200 ideas for any grade, content area (yes – the arts are included) and category in this app. Literally spin the wheel of each section and find an idea you can steal for your classroom the very next day. Big time saver! Blenduko – Talk about addicting! This app is like Tetrus for colors. Students love it and it’s a fantastic way to discover the science behind color theory. Dragon Dictation – As part of our Special Populations and the Arts series, we found this free dictation app for students that can be used in a variety of ways. Have students dictate their work, share artists’ statements, record voice-overs for movie projects and so much more. Lark, by Storybird – This cool free app allows you to create poetry based on works of art that you either find or upload. You can even share it as a message with the messenger app on your phone. Such a great tool for students! Brainsparker – Sometimes, getting out of a creative rut is just about asking the right questions. This free app provides over 200 creative prompts to help you and your students think about problems and creative opportunities in a new way. Roy G Biv – Turn your colors into sound! The app reacts to light and colors in the environment of the image and translates them in an aesthetic way in tones, sounds, and geometrical patterns. IDEO Method Card – Want to use legendary IDEO methods right from your phone? Now you can. Use it as a way to promote critical and creative thinking routines at any point in your lessons. Midnight Music – If you haven’t checked out this site yet, you really need to take some time and explore. Founder Katie Wardrobe shares so many resources, ideas and lessons for integrating music and technology on this site. Kiddovate – Kiddovate is a great source for creative thinking prompts! Be sure to download their free app, but then swing over to their blog where they have lots of ideas and activities that they post for free as well. Genius Hour Innovation Class – If you’d like to implement a Genius Hour in your classroom this year, you’ve GOT to check out this site. It’s a free course/resource with everything you could possibly need to get started or to take your efforts to the next level. The Creative Classroom – We also showcased John Spencer’s book Launch. We’re bringing you his website because it’s just. that. good. Be sure to check out his “Sketchy Videos” area. Powerful learning comes in small video packages! 99U Video Library – Featuring experts like Brene Brown, Chris Anderson, and Clive Wilkinson and focus on everything from design, busting through blocks, and how to fail forward. Inspirational and educational. Bonus: some of these could be a great video to show at the beginning-of-the-year PD days! BoomWriter – Looking for a way for students to collaborate on story creation, ideas, and even projects? This is a great free web-based tool to explore. LucidPress – Need to create newsletters, updates or syllabi for your classes and want them to look their best? Try LucidPress – this is super easy to use and they offer a free educator upgrade. So you can use it for your classroom and your students can use it to design their next project. Project Noah – Project Noah was created to provide people of all ages with a simple, easy-to-use way to share their experiences with wildlife. By encouraging your students to share their observations and contribute to Project Noah missions, you not only help students to reconnect with nature, you provide them with real opportunities to participate and even artfully document their learning. FlipQuiz – If you love to add some gaming to your classroom, or want to use game-style templates for review and assessment, this is a great free website to use. You can use the pre-made boards they have or create your own. MySimpleShow – If you are considering trying some more flipped classroom lessons (having students view the lesson prior to class so you can get hands-on right from the get-go), this is a great tool to consider. Also great if you want your students to teach each other! ChromeExperiments – This is an arts integration and STEAM lovers dream. The front page isn’t all that exciting, but if you click on the “Themes” tab at the top, you can sort by design, music, fractals, 3D, Virtual Reality and more. Agency by Design – This is a web resource for teachers interested in maker education. The group shares “the promises, practices, and pedagogies of maker-centered learning” on their blog and practical ways to use thinking routines in the maker classroom. TES Lessons from Blendspace – This website allows you to browse crowd-sourced lessons from other teachers in all kinds of content areas. You can curate your own lesson/unit board with both your own lesson plans and lesson resources from others. Soundation – This is a free online recording studio that you can use anywhere. Students can collaborate on a piece of music and not even be in the same room. Compose, record and produce in one spot. SF MoMA Teacher Resources – This section of the San Francisco MoMA site for teachers is a goldmine! There are articles you can select and read with students, video interviews, project ideas and an entire section dedicated to STEAM. Presently Gifted – This site offers so many rich ideas and methods for engaging gifted and talented students. And, most of the strategies can be adapted for use in arts classes as well. Academic Earth – This is an open educational resources site – meaning what you find here is free to use. This is centered more for secondary classrooms, but the courses/playlists and journals are great professional resources. We loved the Sound of Music playlist and the Art History course. Cult of Pedagogy – If you’re looking for a great weekly read from the teacher’s perspective, this blog is a must. We especially loved the Pineapple Charts for PD idea that Jennifer Gonzales shared! curious.com – This one is JUST for you. Learn about almost anything you want, personalized to your strengths, challenges and interests. They’ll try to get you to pay for a subscription, but you can “x” out of that and still get a lot of great stuff free! The MET’s Culinary Art Tours – This site provides a fantastic idea for how you can weave together aquaponics, culinary arts, science and visual art. Use it as inspiration for your own efforts!